Making ends meet is a hard task most of us are enduring. We have a lot of responsibilities to face and bills to pay that's why we're left with no choice but to work hard. Sometimes we have to deal with terror and demanding bosses who gives you impossible tasks and unreasonable deadlines. The pressure and stress can get out of hand, but the sad truth is, we tend to keep up with them and extend our patience because we need our job. It's our bread and butter and we can't afford to lose it especially if we don't have a lot of options. A working adult's life is really tough especially if your job is an equal representation of hell. I don't really have an exact answer on how to survive and make it alive out of your job. But I have unsolicited suggestions that MIGHT help you. First of all, remind yourself of the reasons why you're working. Maybe because you want to travel, buy a house or provide your family with a comfortable life. Your reasons for working will motivate you. If you have a goal that needs money to be achieved, then it will fuel you to keep on working hard despite the difficulties. It will also help to take a deep breathe and calm yourself. Work-related stress and pressure can get out of hand but avoid making rush decisions caused by an extreme amount of anger (for example: immediate resignation). You might regret doing so when you're calmed down already. Never make a decision while your emotions are extreme. You have to be very careful and think things over before making a big leap of faith. Don't let office politics get into your nerves. You will really meet and deal with fake people, backstabbers and even ruthless office mates or superiors. Your ideas will clash eventually. You might not like them and they might also not like you in return. A conflict will arise, most probably. But always remind yourself that it wi be useless to put a lot of energy on hating them and bringing them down. Those toxic people won't help you in any way, so, stop investing too much emotion on them—especially anger. It will affect your work performance and when they notice your weaknesses, they will use it against you. Do your job. Focus on what makes you a better employee. Think about your goals. Don't get distracted. Do not let a toxic work environment ruin you. But know when to make a graceful exit. When things get out of hand, when you've noticed that things won't get better despite all of your efforts and when you think your job is no longer helping you to grow professionally, then I guess that's the perfect time to draft your much needed resignation letter. What are the challenges you've faced in your workplace? 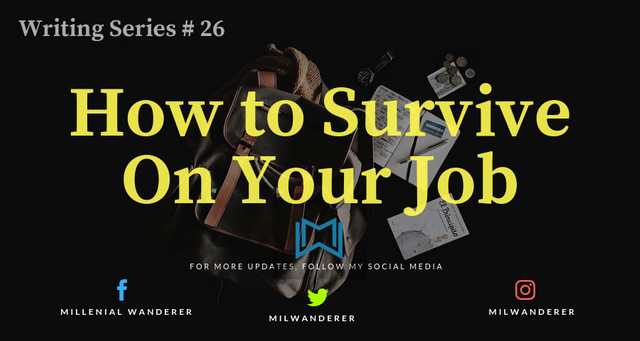 What do you think are the effective ways to survive on your job? Let's talk about it on the comment's section below. Hello @jassennessaj, thank you for sharing this creative work! We just stopped by to say that you've been upvoted by the @creativecrypto magazine. The Creative Crypto is all about art on the blockchain and learning from creatives like you. Looking forward to crossing paths again soon. Steem on!